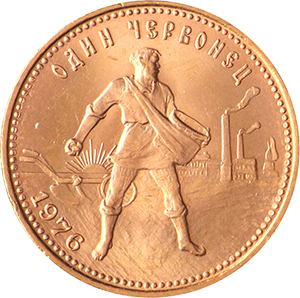 Chervonetz are commonly thought of as Russian gold coins, in fact it originally referred to foreign coins in the region up until the end of the 17th century, although there were examples of Russian made coinage using the name in the 16th century. By 1701, Russia introduced its own gold coinage at a much higher rate and the name Chervonetz remained. 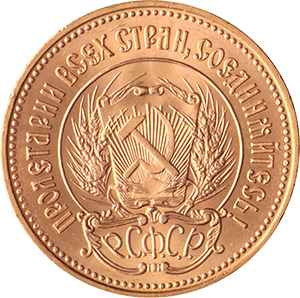 The Chervonetz, as it is thought of in the present day, first began in the early Soviet era, with sweeping reforms to the currency taking shape in the key years between 1922 and 1924, often referring to banknotes as well as coinage. This continues to this day in many parts of the region, where bank notes in Russia, Tajikistan and Moldova are still referred to as Chervonetz. Chervonetz gold bullion was reissued in the 1970’s to compete with the ever-present South African Krugerrand, which by 1980 made up more than 9/10ths of the global bullion market. In fact, many of the coins were first minted much earlier in the century and were not released until this period. Although not officially stated, it is widely understood that these coins were released to coincide with the 1980 Moscow Olympics. Although not of as high a purity as many of its counterparts, 5.9736 carats, its historic value is thought to be one of its main strengths and it continues to trade well above the value of its gold content. It weighs 8.6026g with a gold content of 0.2489oz. Goldinvestments.co.uk are one of the oldest and most experienced traders in precious metals in the UK. Despite trading online, we have an office in the heart of London, from which we are happy to provide advice on any topic related to gold investment.